Composer/lyricist Irving Berlin (1888�89) remains an American cultural icon. While Berlin's classic middle- and late-period works are still known and loved around the world, the music that launched him as "America's greatest songwriter" in the 1900s and '10s is now forgotten and largely unavailable. Yet from a cultural perspective, these early years are Berlin's most fascinating and perhaps most important: through them, Israel Baline � an impoverished immigrant who spoke no English and never studied music � transformed himself and the face of American popular music. As "Irving Berlin", he became an extraordinary commentator on national life and in a breathtakingly short time was making his own considerable influences upon it. 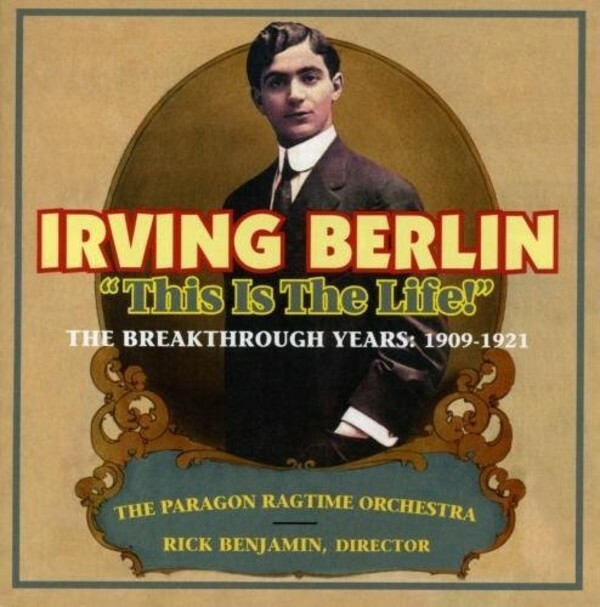 Ranging from his explosive 1907 arrival as "The Ragtime King" into the dawn of the Jazz Age (1917�), the album highlights Berlin's songs for vaudeville, revue, and the Broadway stage. Of particular interest are rediscovered scores from Berlin's first musical � the legendary Watch Your Step (1914). All selections are performed from rare historic orchestrations prepared by Irving Berlin's own staff arrangers and orchestrators. The recording is accompanied by an extensive booklet giving insights into overlooked aspects of Berlin's career, including his curious working methods, as well as his brilliant successes as the publisher of his own creations and proprietor of a true, pioneering "entertainment empire."